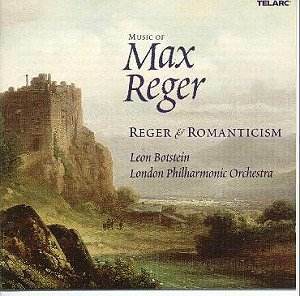 This compilation is aptly titled �Reger and Romanticism� for it is very much in the Late romantic tradition, beautifully drawn, atmospheric and evocative programme music based on the influences of the Böcklin paintings and Hölderlin and Von Eichendorff verses. Reger died relatively young but by the time of his death he was widely regarded along with Richard Strauss as a leading light in the succession of great German Classical and Romantic. The booklet includes reproductions (rather poor ones it has to be said, particularly of �The Isle of the Dead�) of the four Arnold Böcklin paintings. [Böcklin�s highly romantic pictures were very much in vogue with prints hung in homes across Europe in this period]. As it happens the picture of �The Isle of the Dead� decorates many recordings of the much better known Rachmaninov tone poem so the loss of detail is not so crucial. It is interesting to compare the two composers� different approaches to the same subject. Reger takes a more mournful stance and is less preoccupied with a literal translation of muffled oars slipping through misty waters than conveying the painting�s dark, brooding atmosphere. Much less time is concerned with the character of the deceased although there is no denying the power of the brief climax that seems to intimate that, in life, this was a heroic and romantic figure. The opening movement is a portrait of the �Hermit Playing the Violin� with violin soloist, Michael Davis, in sweet piety with Botstein offering an affecting accompaniment. �In the Play of the Waves� is a sparkling scherzo playfully evoking spirits and mermaids cavorting in the waves. The final picture showing a classical Bacchanal is a wild frolic - witty and mischievous. All four sound pictures are vividly drawn, richly harmonised and colourfully orchestrated. The Romantic Suite offers three more resplendent sound-pictures. The opening movement, �Night Magic� is a sumptuous, realisation of the springs flowing� � between lakes and flowers far to the quiet woodland lakes where the marble statues are erected in beautiful solitude. Softly coming down the mountains awakening the ancient songs, the wondrous night descends and the grounds sparkle once again as you�ve so often seen in dreams.� Botstein weaves sheer enchantment here; the music, perfumed, shimmers luxuriously. The ballet-like �Fairies�, the second movement, maintains the spell ��We�ve covered the valley�s dance floor with moonlight, glow-worms light up the ballroom��, the music fairy-dainty, gossamer light, puckish and mercurial fleet-footed, the melodies dewily romantic. �Eagle� brings the dawn with music that softly brushes aside the mists and dreams of the night to usher in the magnificence of the rising sun and the awakening of the world. A colourful crescendo bursting forth in splendour. Catherine Wyn-Rogers as the dying supplicant in Reger�s realisation of Hölderlin�s �An die Hoffnung� (To Hope) is suitably doleful and soulful. �Where are you, O hope! I�ve lived so little; yet I feel the cold breath of my evening �� cheering briefly for fonder remembrances of �the green valley where the fresh spring flows�"
A sumptuous feast of Late Romantic splendour � music to set the imagination flying. Heartfelt performances communicated with verve and attack aplenty; and captured in Telarc�s stunning sound. Heartily recommended for all unashamed romantics.